From très jolie to oh la la, our journey into Paris’s magnificent world of fashion continues and gets even more striking as we move on. When the official Paris Fashion Week comes to an end, it doesn’t necessarily mean that fashion has also come to a sudden halt. On the contrary, fashion is one of the many important elements that Paris has to offer and it is an aspect that is continually present throughout the year. In many ways, fashion is the city’s heartbeat: it continues to pound and races to the hearts of people all around the world. Our journey will begin with classic seduction and then move into modern appeal. Guy Laroche was founded in 1961, representing feminine and gracious appeal for women to enjoy. 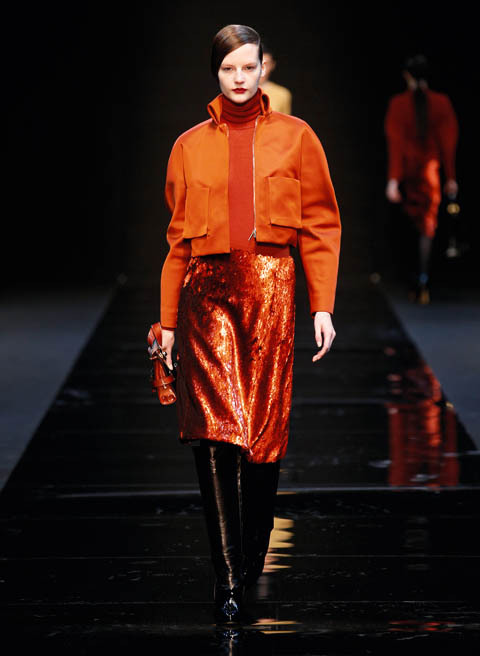 Alber Elbaz was the artistic designer from 1996 to 1998; Franco-Swedish designer Marcel Marongiu has in the role since November 2007 and has continued to sustain Guy Laroche’s definition of fashion. The autumn–winter 2012–13 women’s ready-to-wear collection took place at Éspace Ephémère Tuileries inside a large tent in the middle of the open garden. The shimmering, black runway prepared for a number of looks, many of which had a polished finish. From black and sober to flaring gold and shiny reds, the structures and streamlined cuts of each ensemble accentuated the contours of one’s body. Accessories included leather gloves, leather boots and matching bags. The designer revealed a simply intriguing woman of style. Another unique touch to the collection was the slim, tightly hugging tops with slightly bulging sleeves. The gold on black ensembles accentuated a flawless feel. The original and particularly chic details of the clothes formed a flamboyant, exhilarating and flawless finished product. 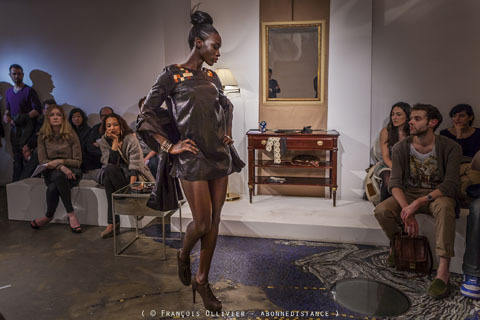 Shying away from the more traditional runway shows and presentations, Olympe Jaffré presented Olympe75018’s collection with a slightly new and different approach. The house took a crisp and daring direction, proving the idea that fashion is made to express vividly the wearer’s personality. 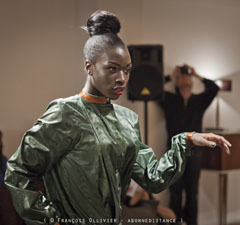 The fashion show took place on March 22 at the Galerie des Ateliers de Paris near the famous Bastille. The venue was surrounded with a number of invited guests, to enjoy more than a show. 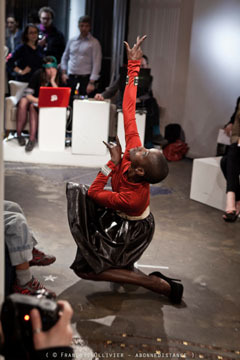 It was also an escape into a new realm where two forms of æsthetic features collided: dance and fashion. Jaffré is known to collaborate with disc jockeys, video jockeys, visual artists, choreographers, photographers and other professionals to make her shows and projects a whole new contemporary experience. With only three models to present the new season’s collection, Low-Tech Melancholia, they conducted a fashion show dancing their way down the runway following the music’s rhythm or even making up their own. The pieces are contemporary and classy, representing a highly captivating woman dressed in finely cut pieces with vivid colours. The presentations were just as stunning and striking as any of the runway shows. The more laid-back ambiance offered time and greater attention to the pieces on display. Pollini was founded by Romeo and Domenico Pollini in Italy in the turn of the twentieth century. It first began as a family-owned brand mainly specializing in shoes, but soon it began to evolve. Eventually, the small brand became internationally recognized as its marketing expanded to Germany, Paris and New York. Currently, Scottish designer Jonathan Saunders is the brand’s creative director. The majestic Hôtel Crillon, located on the Place de la Concorde overlooking the splendid Jardin des Tuileries, welcomed guests into a small venue with fabulous pieces from the fashion house’s new season’s collection. The accessories’ designer, Nicholas Matthew Kirkwood, displayed splendid detailed pieces of elegance. Kirkwood has created shoes perfect for the catwalk for other fashion houses, including Rodarte and John Rocha. The young designer mixes and matches seductive materials together including snake skin, suede, satin, leather and dégradé fabrics almost creating an original three-dimensional effect. The setting was every shoe and bag lover’s dream come true, with a range of designs to choose from, for the discreet girl to the more enticing woman.